So, you’re thinking of installing a new shower room? Every home is different and choosing the right shower enclosure to suit both the space and your needs can be challenging. The good news is that it’s possible to position a stunning glass enclosure almost anywhere. At Showerpower we have created beautiful frameless glass shower enclosures in alcoves, attics, basements, under stairs and corridors, even a space that was previously a cupboard. So, whether you are considering a spa-style wet room big enough to party in or just want to fit a separate shower into your bathroom, read our guide to help you decide. Where to place your shower room? You’ll need to consider what available space you have and the kind of enclosure you’d like. Look at the layout of the space to see which walls you could use to form the basis of your enclosure. Don’t restrict your thinking. You could possibly move a door, window or wall to create room for a shower. It’s worth noting that shower pipes are easier to install into a stud wall rather than a brick wall. You’ll also need to meet all UK building regulations. 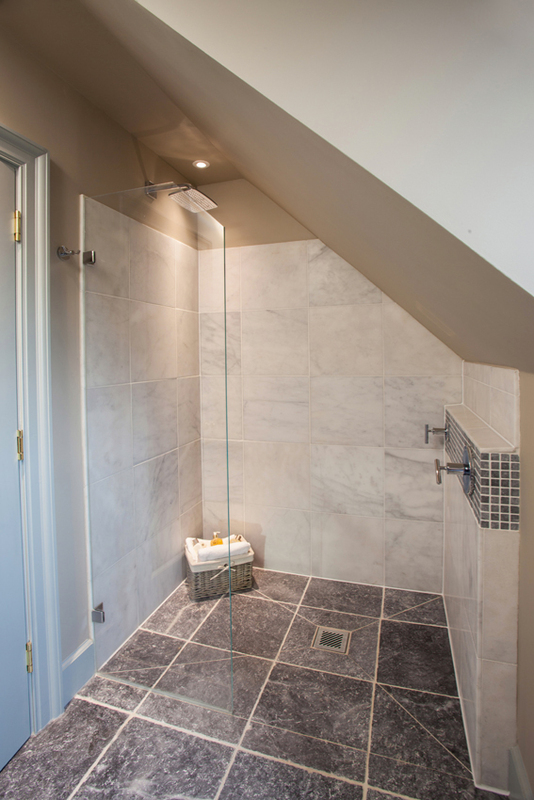 A loft conversion shower adds extra convenience and value to a home. Read our 7 reasons why you should install a shower in your loft. Don’t be put off by slanted ceilings or irregular surfaces. With frameless glass, you can have a shower enclosure custom-made to fit under any sloping roof. If you’ve got a generously-sized bathroom, then accommodating a separate bathtub and shower unit will give you the most flexibility. Consider every possible configuration for your bathtub, toilet, basin and shower. It’s amazing what you can squeeze in, especially if the shower enclosure is made from frameless glass, as it can be cut to fit the space. An en-suite shower room attached to a bedroom is a highly sought-after feature adding value to a home and providing extra privacy and convenience. The minimum space required for an en-suite consisting of a shower cubicle, basin and toilet is approximately 0.8m x 1.8m; and even this tiny area can look amazing with a frameless glass enclosure. Alcoves and recesses can be ideal spots for a shower. Depending on the size and shape of the space, and you have three walls close together, you may only need a single, made-to-measure frameless glass door across the front to complete the enclosure. A corner shower utilises two walls and is an effective space-saving design. The traditional shape of a corner shower unit is square, but if this takes up too much floor space, curved or pentagonal or neo-angle enclosures don’t protrude as far into the room. A pentagon enclosure resembles a square with one corner cut off. A walk-in shower is a design for open-plan bathrooms and offers a luxurious showering experience. Many people are even replacing the bath tub to create this type of spacious shower room. Walk-in showers are easy to clean and maintain, and give a bathroom a high-end minimalist look. No door and a low shower tray aids accessibility for those with restricted mobility. This is a sealed bathroom which requires careful planning. The walls and floors are “tanked” to stop any water from seeping out. The room normally requires a sloping floor leading down to a drain, so excess water flows away. A wet room is potentially the costliest shower option as the whole room needs to be completely watertight. No nooks and crannies makes it easy to clean, and no shower tray makes access easy. Consider having a glass screen to protect towels or robes from getting wet. Creating one wet room for bathing and showering is becoming increasingly popular. This configuration has a spa-like feel and look, and can take up less space than having separate tub and showering areas. It’s also a family-friendly arrangement as the children can take splashy baths without water going all over the floor. The vanity area can be kept dry with the addition of a frameless glass shower screen. Steam rooms are the hottest trend for homeowners wanting to create a therapeutic spa experience at home. They require a specialist glass enclosure because steam gets hotter and permeates more easily than water does. We specialise in custom-making glass shower enclosures for homeowners in Sussex, Surrey, London and across the south east of England. Our designers can create frameless glass doors and screens for any layout, whether the shower space is tall, narrow, triangular or curved. We would be delighted to advise you. So please get in touch. You can contact us online or call us on 01403 829020.